Malki’s unbelievable path as an apostle to the Arabic-speaking world will build up faith and challenge Christians to service. In any of the one hundred and fifty sects and sub-sects of Islam, the common denominator is Allah. Who is this Allah? Much has been written on the religion of Islam and its prophet; but not much is said about the God of the religion. 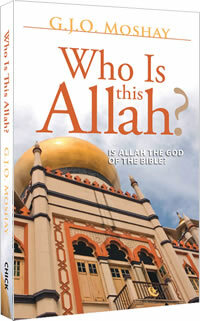 One reason is the assumption that the God of Islam and the God of Christianity are one and the same. For example, if Allah is the true God, and the Qur’an, Islam’s sacred book, is true, then Christians can be sure they are lost, no matter how zealous they may be. The reverse would also be true. It is necessary, therefore, to provide sufficient information to enable you to determine your own verdict, and answer the question: Who is this Allah? This book will do that. Mohammad Al Ghazoli was raised a Muslim. But the more he read the ancient literature of Islam, the more convinced he became that Allah could not be the True God. And the more he studied the life of Muhammad, the more obvious it became that Muhammad was not God’s prophet. Then one day, someone placed a Bible in his hands and said, “Read.” Soon Ghazoli had found the True God, and forgiveness through His Son.